Xcel Energy, Panasonic and Denver International Airport plan to build a $10.3 million solar microgrid in Colorado to demonstrate the use of batteries in a microgrid. Public Service Company of Colorado, an Xcel subsidiary, applied for approval of the microgrid last week before the Colorado Public Utilities Commission. If approved, the solar microgrid will be installed at an airport parking garage near a new commuter rail. The Panasonic Enterprise Solutions Company headquarters is being built across the street, near 61st and Peña Boulevard in Denver. The microgrid will include 1.3 MW AC canopy solar installation and a 1 MW — 2 MWh lithium battery storage system. The batteries will serve the grid and provide back-up power for the building. 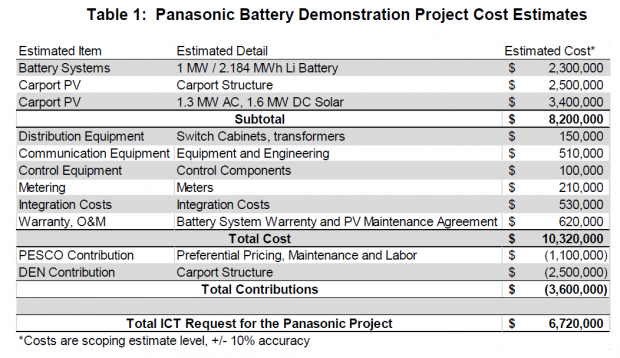 Xcel will own the installation, and Panasonic will service it. The partners are trying to better understand the ability of microgrid to island a building from the central grid, according to written testimony before the commission from Chad Nickell, manager of distribution planning and strategy at Xcel Energy Services. The microgrid will come into play when the automated switch cabinet detects a disturbance on the grid. It will then disconnect the building from the main grid. The solar panels will stop generating electricity, and the battery will serve the building’s critical services. Xcel hopes to learn more about design, procurement, permitting and construction of microgrid and storage projects. The project also gives the utility a chance to evaluate and test the power control systems, which are becoming increasingly ‘grid aware’ — able to switch with less human intervention between operating modes based on grid conditions. The partners joined the utility in the project to help them achieve specific business goals, according to the testimony. For the airport, the solar microgrid showcases its commitment to sustainability, improves its electric reliability and may foster growth in future aviation projects. For Panasonic the project demonstrates ways the company can manage energy for its customers and provides a national showcase for Panasonic’s collaborative research and development. The solar microgrid is one of two innovative projects that Xcel asked the commission to approve. The other project, at a separate location, involves installation of a series of batteries strategically placed on a residential feeder where there is a great deal of rooftop solar. Known as the Stapleton project, it will help the utility understand how customer-sited batteries can benefit the utility distribution system. Xcel is seeking expedited review of the projects, which would mean a decision within 60 days. The two projects are part of Xcel’s Innovative Clean Technology or ICT program. The utility has built two other projects through the program: a concentrating solar facility and community energy storage. Track progress on the Denver solar microgrid by subscribing to the Microgrid Knowledge newsletter. It is free. What was the reason for using a AC microgram? 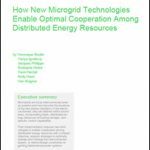 would it not have been much more efficient and innovative to trial a DC microgrid?